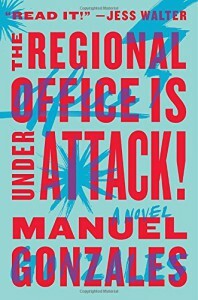 The Regional Office Is Under Attack - a comic book of a novel - great fun - "So it goes." How to describe this... It's about superheroes while they're "off duty" and a specific group of superheroes -- all women. They're recruited by a place that is a travel agency unless you want to go to Akron Ohio, in which case it's the global HQ for these amazing magic women and the people who organize them. And the book takes place while their HQ is under attack. I can't tell you much more than that without spoiling it. It's humorous without being satire and without mocking superheroes of the more usual sort. Clearly written by someone who loves the heroes we all know and love and also completely different in the angle we watch from. The humor isn't at the expense of our usual heroes, it's just that we're in on their inner-most thoughts - stuff like "this is a f-ing ridiculous way to die" etc. A very fast read because it's easy and I wanted to know how it was going to turn out. It started a tad slow, and we get the back and forth from present to past and back again (a gimmick I'm really starting to see as a novelists easy way out, but it works here.) I feared it would be all origin story, but it's absolutely not. There are very few feelings, and the only adjective is the F word - all of this sounds terrible. Maybe it's just my mood. I have been wanting light lately and this hit the spot. There's no great depth, which is exactly why it works. I've read comic books that felt a bit like this but never a novel. It's different and therefore quite interesting as well as just plain fun.